Five years after the „Responsib´ALL Day“ specifically dedicated to raising awareness of responsible drinking, education and prevention of excessive drinking, we have decided to take the event in 2016 to a whole new level. Five years after the „Responsib´ALL Day“ specifically dedicated to raising awareness of responsible drinking, education and prevention of excessive drinking, we have decided to take the event in 2016 to a whole new level. The so-called “sharing conviviality” has been molten into 4 engagement areas which define the company standards of Pernod Ricard. This year the name of the game as far Responsib´ALL Day is concerned, was all about responsible conduct and team work. That is the very reason that all 18 000 employees of the Pernod Ricard Group stood united in an effort to achieve a common goal – going the extra mile on the path to a responsible approach to the environment we live in as well as shaping something that benefits all of us in the long haul. We, at Pernod Ricard Slovakia have embarked on a mission to join forces with the organization Mestské lesy Bratislava (City forests of Bratislava) which is in charge of managing Železná Studnička, the place that is immensely popular with Bratislavans. The local amphitheatre on Partizánska Lúka is currently hosting various cultural and social events. Sadly, it has seen better times. That was undoubtedly the reason we rolled up our sleeves and got down to business. 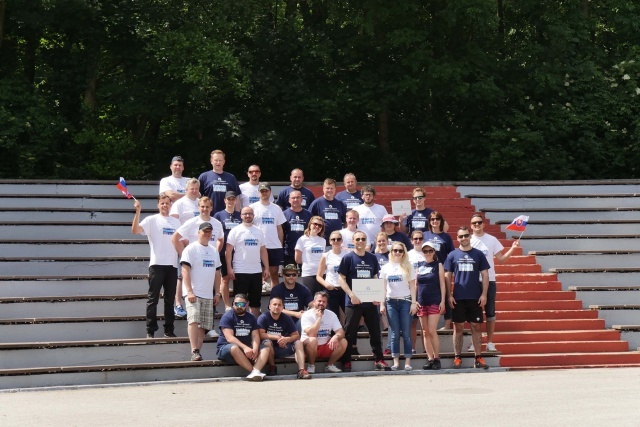 All 37 employees of Pernod Ricard Slovakia went beyond the call of duty and got this project enthusiastically off the ground by cleaning, doing a paintjob and renewing the amphitheatre. Our effort was fully repaid with a mere glance at the new, reconstructed place that is going to serve the local community, families and all its visitors of this beloved attraction for many years to come. Our effort has also been appreciated by the deputy mayor of the district Bratislava-Rača, Rastislav Žitný. „Of course, I am extremely delighted that I have had the chance again to see our employees‘ dedication to what the Pernod Ricard Group defines as responsible conduct. Apart from teambuilding, I am glad to have been part of something that truly benefits all of us. I am confident that our accomplishment here definitely gives us a reason we can pride ourselves on, “as Erik Čížek, the Managing Director Pernod Ricard Slovakia expressed the dedication and enthusiasm of his co-workers.